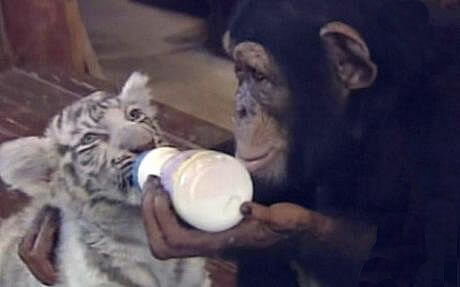 This pictures shows a chimpanzee playing foster mum to two white tiger cubs. The photograph was taken at Miami’s Jungle Island and show chimp Anjana looking after two-month-old cubs Mitra and Shiva. The white Bengal tiger cubs were taken from their mother’s zoo in South Carolina to be in a warmer and dryer environment. China York, a carer at Jungle Island, said Anjana keeps the cubs happy by giving them their bottles of milk and joining in their rough and tumble play. She picked up on the fact that I’m taking care of the babies so she wants to care for them. She’s not necessarily maternal but she’s really gentle with them. She likes to pet them and see how they’re doing and if they’re crying she gives them a finger to pacify on like you would a baby. Or she gives them a bottle to feed them on. The two tiger cubs were born during a hurricane and had to be separated from their mother after their sanctuary flooded. They will stay with Anjana at Jungle Island for a couple more months, when they will be too big to play with her.